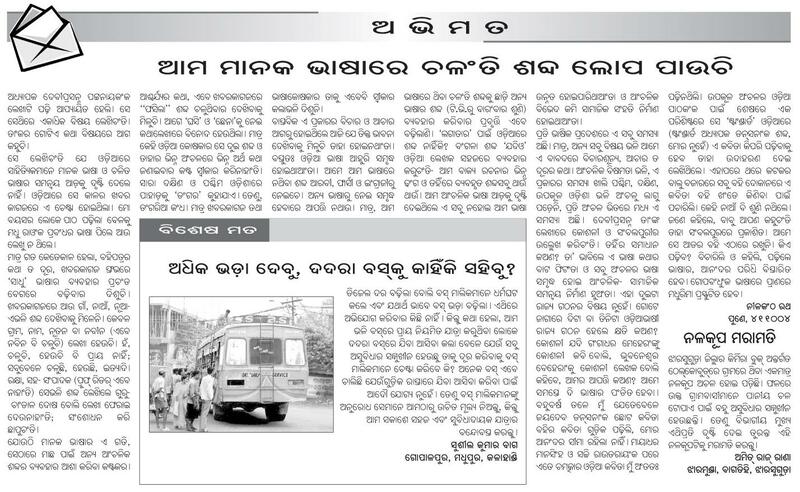 Following is an article from the Samaja (Cuttack-Morning Nov 21, 2011 Page 6 online edition). My thanks to the honorable writer for very good analysis and logical conclusion.Click here to download the complete pdf. Following paragraph is taken from http://www.ciil.org/AnnMLE2011.aspx. …………….Two states in India – Andhra Pradesh (AP) and Orissa – have started mother tongue based multilingual education (MLE) on a pilot basis for tribal children. AP started MLE in 8 tribal mother tongues (MTs) in 2004 and Orissa in 10 tribal MTs in 2006. The states have the program in over 500 schools with first batch of children in grades IV and V, respectively, in AP and Orissa; AP is adding over 2300 schools in the year 2011 and Orissa is scheduled to add 500 schools. Few more states are also expected to join the MLE movement in India. Jharkhand, Assam and Chhattisgarh are already planning to start MLE in the states. Mother tongue based MLE is now an international movement especially for those from dominated minor, minority and marginalized languages and suffering negative consequences of submersion and assimilation forms of education in non-mother tongue languages ………………………. The Kosli language is spoken in ten districts and Athmallik subdivision of western Orissa. In addition a large population of Raipur, Mahasamund and Raigarh districts of Chhattisgarh state speak Kosli language as their mother tongue. A large number of books and magazines are published in Kosli language. Kosli songs and dances are popular across the world. Apart from this Kosli drama festivals are regularly organized in various places of western Orissa. Following comment was posted in our earlier posting. For the convenience of readers we are posting it here. 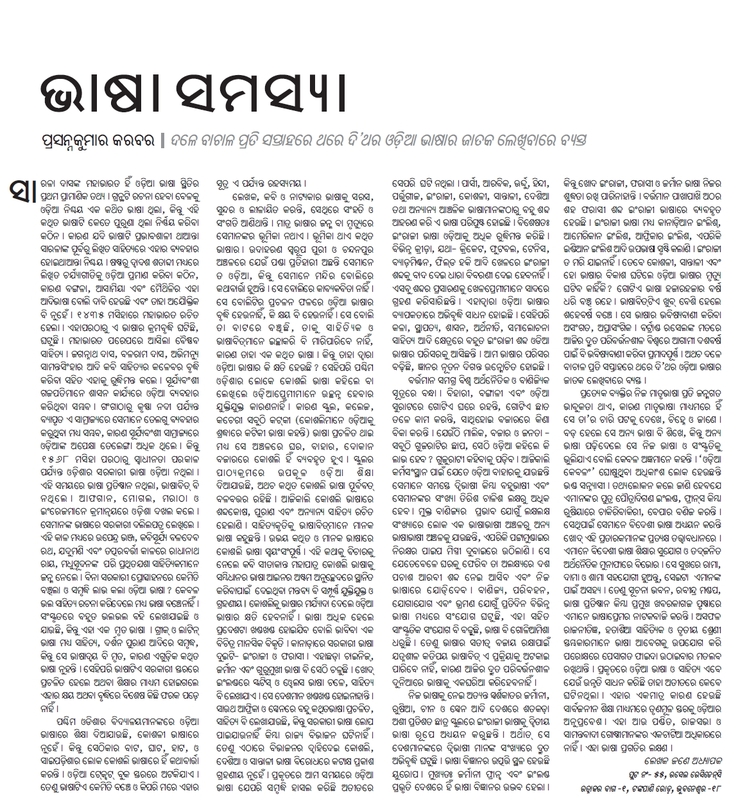 After reading the above comments on Kosli language and literature I have to offer my views. 1.South Kosal is a tract identified with current western Orissa adjoining eastern Chhtishgarh. Kushavati Nagra is found to be the capital of Kush – the second son of Lord Ramachandra. 2. South Kosal is found in the puranic and Sanskrit canons which have the records of ruling dynasties. 3. Koshalananda Kaavaya is written for the Chauhan Kings in 16th century AD is the evidence of Kosal as Sambalpur and interestingly Pundit Gangadhar Mishra was from Puri, a court poet in Sambalpur Raj-durbar. 4. Dr Suniti Kumar Chaterjee, a noted indologist and historical linguist mentioned in his work (1967 Dr Artaballabh Memorial speech in Orissa Sahity Academy ), Dr. Krushna Chandra Panigrahi, a noted historian, and Dr. Khageswar Mahapatra, a linguist, in their work have mentioned about the distinct language of South Koshala which is not intelligible to the Oriya people. 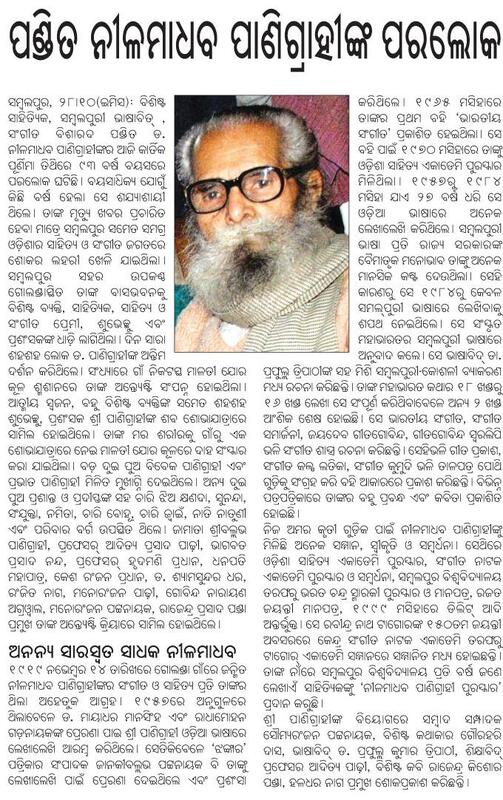 Even to day, the pure oral tradition of Kosli language is unintelligible to Oriya people. 5.The writings of Dr Harekrishna Mahatab indicates that Kosal was never a part of present Orissa before the British Raj. He was unable to face Maharaja RN Singh Deo as stated Sri Nilamani Raotray.in the auto biography. Formation of Orissa is a modern aspect in which the contribution of Britishers and Madhubabu can be mentioned. But to my knowledge till the merger of 26 garjat Orissa was never conceptualized as a state. Presently the National Curriculum Framework 2005 and Right to Education Act 2009 has emphasized the linguistic Human Rights of children to pursue their learning in primary schools. Based on this Act and NCF 2005 , ten tribal languages in Orissa has been adopted to teach the tribal children in mother tongue. The Munda and Kishan languages of Sundargarh has been accordingly taken up. Thus it would be proper now to take up Kosli as the medium of instruction in primary classes. Kosli should be a subject and also the medium of instruction in primary stage at least from Class I to class V.
Oriya colonialism is unfortunately created a hegemony among the people not only of Kosal but also to the Adivasis of Orissa for which the self hate for one’s won language and culture had been created. But now the turning point is that many tribal languages are regenerated and revitalized by the speakers community and no qualification is required for that. Consider when Sweden was subduing Finland over a period of 300 years and the oral tradition of Finland became the written literature of Finland. Now Kalevala – the national epic of Finland is Kalevala which was sung by the unlettered singers and now it is a widely known as National epic translated in to 204 languages of the globe. Now the rich oral literature of Kosal followed by hundreds of writers from Kosal can revitalize its own culture and language, not only to restore it for language sake but the epistemology and worldview that is created across the ages. Following write-up was sent to various e-forums by Dr. Arjun Purohit. This is was his final response to Debi babu’s article. Earlier he has sent three massive emails as response. Here is the link to the previous postings (Part I and Part II) . The force of language Dr.Patnaik uses against inclusion of Koshali in 8 th schedule is not warranted nor necessary because we both in education field know that educating kids through the medium of native language especially in formative years will facilitate learning. So why such denial ? A possible explanation may be found the way our history books are written. For instance, Dr.Harekrushna Mahatab who has been lionised in Orissa for his political leadership as well as for his contribution to Orissa history, writes the very first sentence in the first volume of two volume book ODISHA ITIHASA(1948),”Today what is understood as the state Odisha consists of three ancient provinces called Udra, Odra or Oudra,Utkala and Kalinga”. (my translation) Really ? No Koshala ? So what is the status of Koshala then ? Is it a colony of Odisha ? Just an appendage of no consequence ? We do not see our face in this definition of Orissa. We are simply persona non grata, who do not deserve to be recognised as legitimate citizens of Orissa with equal rights and privileges.. Our language and heritage simply do not matter. Is it just innocent omission ? A few years later Siba Prasad Das wrote his classic SAMBALPUR ITIHAS(1962),reprinted in 1969 and I find in it an appreciative note by Dr.Mahatab written on September 16,1967. However the quoted statement still appears in the third edition of Dr.Mahatab’s book published in 1977. For generations this book has been used as the text book on Orissa history in schools and colleges. It is lot more than just a Freudian slip because this attitude permeates into all the de facto policies and procedures practiced in Orissa which has resulted in the sorry mess in Koshal. The same attitude is reflected in Dr.Patnaik’s essay. Why it is so difficult to accept us for what we are ? Dr.Patnaik wonders whether asking for recognition may lead to aspiration for a separate state ? Aspiration for recognition of Koshali in 8 th schedule is an issue which must be judged by its own merit whether or not in future Koshal may get status of separate state. Should we deprive Koshali kids’ access to education so that in future they may aspire for the same rights and privileges of kids in the coastal area or demand for a separate state ? This is akin to the same thinking behind denying education to Sudras to prevent them to aspire the same status Brahmins and Kshatriyas. This is why Rama killed Sambhuka the Sudra when he was found to be studying Vedas. For the same reason Drona demanded that the thumb of right hand of Ekalabya be chopped off because someday he might be challenging Pandava and Kaurava princes. Until a couple of generations ago girls were discouraged to go to school because in future they may not be “ideal” wives. Women in Afganistan must be cooked inside their burqa all the time even in hot weather so that they may not get amorous attention from males. Slaves inU.S.were not allowed to study even private so that they could be as smart as their masters………..
Dr.Patnaik acknowledges the abominable attitude and treatment by coastal folks towards Koshalis and folks inSouth Orissawhich has resulted in severe economic deprivation. That is precisely why both Koshalis and folks fromSouth Orissa(Kalinga Pradesh) are looking for separation. Demand for recognition of Koshali is primarily to facilitate education of the kids, enrichment of our language and literature by accessing resources available assigned to languages in the 8 th schedule and some measure of self respect. Separation of Koshala will depend upon many other variables besides self evident economic disparity. Our neighbours to the west(Chhattisgarh) and to the north(Jharkhand) are already separated. Telengana is about to be separated. Creation of Gorkhaland is already announced though they are working out the actual framework. Language or numerical largeness are no longer the definitive issue in creation of a new state. In the case of Orissa, one notices a steady erosion of trust in provincial government, which is reflected in voting pattern in Koshal area. Governance has deteriorated with steady rising of Naxalism. And there is a host of other factors which are converging towards separation. By the same token, I also want the fellow Koshalis to realise that having Koshali recognised is not going to solve all the problems in Koshal. So depending on the language card alone is just a mirage. In this posting the focus is on language; so I will not digress into other issues here. Dr.Patnaik pointedly asks whether the demand for such inclusion is aimed at garnering various awards. Great works of literature, music or painting are rarely done for external rewards. These are expressions of artists’ expressions of primordial artistic impulse and rewards are mostly intrinsic. But by denying the modes of expression, both the artists and the public are losers. Great literature can come from even the most primitive language or colloquial language. Julius Axelford and Issac Basevis Singer got Nobel Prize in Literature writing in Yiddish, a dialect spoken in Jewish ghettoes inPolandandHungary. A Sniti Mishra from Balangir mesmerised wholeIndiarecently for her songs. A Mr. Patra from Khariar was one of only three Indians invited to the recent Royal wedding. The Royal family was impressed with his writings in English.A Debasis Rath from Sonepur developed much used Oriya fonts for writing in computer. A Nil Madhab Panda from Sonepur again produces more than fifty movies but not much known in Orissa. Watch his new award winning movie I AM KALAM scheduled to be released in India.The list is long.What genius might be lurking and dying in the vine in Adivashi population, who constitute nearly fourth of Orissa population, is any body’s guess. Anthropologists tell us that we have sixty different groups of tribals. Their unique experience may be a mine of unique artistic impulses which go undiscovered. Both Koshala and Orissa are losers when we can not provide any modes of expression. So rewards will come on its own. Our responsibility is to find stimulate the artistic and literary genius. The real focus of Orissa as well as Koshal should be as to how to be ready for the 21 st century in stead of wasting our energy in minor peripheral and often inconsequential issues. When Indiais emerging as an economic super power, Orissa and Koshal occupy the unenviable position of bottom of the heap in almost every sociological index in spite of their vast natural endowment. Crucial to rise up to our potential is to upgrade our human resource. In Koshal, a thin layer of developed human resource is confined to major urban area, and as you proceed more and more towards less urban area, human resource competency declines steadily. We have a humongous Adivashi population who have not participated in any serious developmental enterprises. No matter how much industrial/mining activities take place in our area, without matching upgrading human resource, Koshal and Orissa will never rise. Ever neglected Adivashi population has been attracting attention for the past decade or so for the wrong reasons: Naxalism, displacement from their habitat or similar reasons. So what language has to do with all these. Plenty. To be able to launch any educational/training programs, the teachers have to work with them through the medium of communication used by the target population. Simply throwing money in to these projects will not work. In Koshal area we have one advantage.In my experience even the reomotest tribal community has functional capacity to communication in Koshali. This is one of the major reasons I will champion the cause for Koshali to be included in the 8th schedule. Such inclusion will provide at least one stepping stone to bridge the gap between educational endeavour and the readiness of tribal kids. Hopefully, we will develop many more stepping stones. If you know Bengali, please estimate the similarity and intelligibility between Oriya and Oriya. Then estimate on the same criteria the difference between Oriya and Koshali.